A number of historic marker buildings form a distinctive silhouette along the riverside landscape between Dartford and Gravesend. 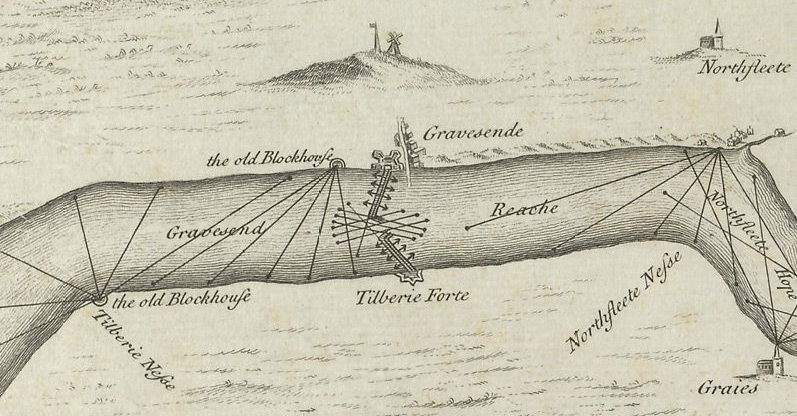 The map of 1588 locates Thames defences (above). Windmill Hill in Gravesend and Northfleet Hill can be seen with buildings of strategic importance; possibly used as defensive look-outs and beacons. Windmill Hill was originally the site of a beacon in 1377, which was instituted by King Richard II, and still in use 200 years later at the time of the Spanish Armada. The hill offers extensive views across the Thames and became a popular spot for Victorian visitors to the town with the installation of a camera obscura.